Fig. 13.4a-c. Distal ureteric obstruction inpatient with locally recurrent cervical cancer. 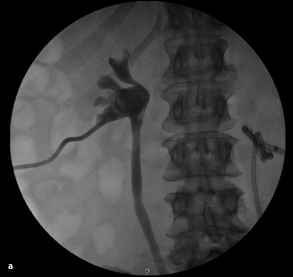 a Antegrade nephrostogram demonstrating left hydronephrosis and hydroureter, indwelling ureteric stent is visualized within right ureter. b Obstruction visualized at level of distal right ureter, no contrast within bladder. Fig. 13.5a, b. Distal ureteric obstruction in patient with locally recurrent cervical cancer. a CT demonstrating bilateral hydrone-phrosis. b Posterior pelvic mass invading and displacing posterior bladder wall ing oncologic prognosis, quality of life, and treatment-related complications. Quite often, malignant ureteral obstruction is a late presentation of advanced, incurable malignancy and portends a poor prognosis. In this circumstance, the provision of ureteral decompression is unlikely to improve either the quality or quantity of life. The median survival of patients with active malignancy who undergo renal decompression through internal or external drainage is only 3-7 months (Wilson et al. 2005; Donat and Russo 1996; Shekarriz et al. 1999). The only situation in which ureteral decompression is uniformly recommended is in the infrequent circumstance that an improvement in renal function will facilitate the provision of therapeutic or palliative chemotherapy (Russo 2000). Lymphoma and germ cell cancer represent two such chemotherapy-sensitive malignancies wherein maximal preservation of renal function is an important determinant of chemotherapy delivery and ultimate success (Logothetis et al. 2003; Ondrus et al. 2001). Noninvasive treatment modalities, including retrograde internal ureteral stent (IUS) insertion and radiology-guided percutaneous nephrostomy (PCN) insertion, are most appropriate for malignant ureteral obstruction. It is difficult to make a firm recommendation in either regard since the quality of life they afford appears to be similar and both options have an equally high complication rate (13%-63%) (Little et al. 2003; Ganatra and Loughlin 2005; Donat and Russo 1996; Shekarriz et al. 1999). Stent or PCN-related infection, obstruction, migration, and dislodgement are common and often necessitate prolonged hospitalization. In experienced hands, PCN drainage can be established in 98% of cases, with a major complication rate of 4% (re nal hemorrhage requiring transfusion, vascular injury, sepsis, bowel injury, lung injury) and a mortality rate of 0.05%-0.3% (Dyer et al. 1997; Stables 1982). Cysto-scopic IUS insertion appears to have a higher initial failure rate (15 % - 79 %) than PCN, leading some authors to propose that PCN should be the management option of first choice in the acute setting (Ganatra and Loughlin 2005; Chitale et al. 2002; Park et al. 2002). Likewise, the accumulated incidence of recurrent obstruction maybe higher with IUS (11 %) than with PCN (1.3%) (Ku et al. 2004). Numerous studies have sought to determine if tumor type, degree of hydronephrosis, and level of obstruction are predictive of treatment failure; however, the results have thus far been contradictory (Ganatra and Loughlin 2005). That being said, some centers do recommend immediate PCN for ure-teral obstruction secondary to advanced cervical cancer citing high failure rates with IUS in the short and long term (Ku et al. 2004). Cystoscopic evidence of tumor invasion appears to predict for IUS failure; therefore, radiographic imaging suspicious for involvement of the bladder and ureteral orifice is an indication for initial PCN. One-third of patients will ultimately fail IUS within 6 months and require long-term PCN due to repeat obstruction. Attempts to improve the long-term success rates of IUS include frequent stent exchange (every 3 months) and the ipsilateral insertion of two indwelling ureteral stents (two 7-F stents) (Ganatra and Loughlin 2005; Rotariu et al. 2001). Periodic imaging to confirm interval resolution or improvement of hydro-nephrosis is also warranted in patients with IUS. Despite the relativelyhigh failure rate ofIUS, most authorities recommend a trial of retrograde ureteral stents in all patients without obvious involvement of the distal ureter and bladder (Ganatra and Loughlin 2005). Likewise, PCN tubes should be converted to IUS in an antegrade fashion after a period of renal decompression. Situations in which retrograde stent insertion is advisable over PCN include those in which anatomic anomalies present a technical challenge to PCN insertion (e.g., horseshoe kidney) or cases involving a solitary kidney in which renal loss secondary to PCN-related renal hemorrhage would be disastrous (Uthappa and Cowan 2005). Decompression of solitary or bilaterally obstructed kidneys may result in a postobstructive diuresis with urine output in excess of 200 ml/ h. Most commonly, this reflects the appropriate excretion ofexcess sodium, urea, and water retained during the period of obstruction. Apart from the provision of oral fluids and the periodic evaluation of serum electrolytes, this form of diuresis requires no specific intervention. Serum creati-nine and blood urea nitrogen typically normalize within 48 h. On occasion, a pathologic diuresis involving water or sodium-wasting may ensue secondary to significant distal renal tubular damage. Vital statistics in cluding postural blood pressure measurements should be performed on a frequent basis if a pathologic diuresis is suspected. These patients require careful monitoring and copious fluid replacement with 0.9 % or 0.45 % saline in order to avoid dehydration and electrolyte abnormalities. In light of the significant long-term complication rate associated with mechanical drainage, patients with IUS or PCN require periodic monitoring with serum creatinine, urine culture, and upper tract imaging. Ure-teral stents and percutaneous nephrostomy tubes should be exchanged every 3-4 months to prevent encrustation and obstruction. Depending on the chemotherapy or radiation-sensitivity of the etiologic malignancy, mechanical drainage may not be required indefinitely. Most cases of extrinsic obstruction secondary to germ cell or lymphomatous retroperitoneal lymph-adenopathy will resolve with appropriate cytotoxic chemotherapy (Logothetis et al. 2003). Likewise, up to 70 % and 85 % of patients with hormonally nai've locally advanced PCa treated with androgen ablation or radiotherapy, respectively, will experience a relief of obstruction, obviating the need for mechanical drainage (Michigan and Catalona 1977; Megalli et al. 1974). Malignant ureteral obstruction is, in most cases, a manifestation of advanced, incurable disease and portends a poor prognosis. Even with the establishment of mechanical internal or external drainage, the median survival is 3 - 6 months among the most common etio-logic malignancies. Furthermore, treatment-related morbidity is high and patients can expect to spend a significant portion of their remaining days in hospital (18%-46%) (Little et al. 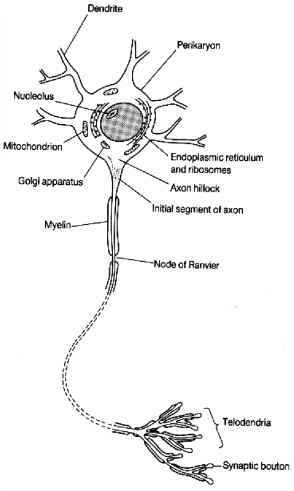 2003; Romero et al. 2005). While IUS or PCN appear to be of questionable benefit in the palliative setting, they retain utility in the treatment of chemotherapy or radiation-sensitive malignancies. Clearly, this is a situation in which treatment, however minimally invasive it may be, should be approached in a cautious mannerand only after due consideration has been given to the ultimate prognosis as well as the wishes of a fully informed patient and family.